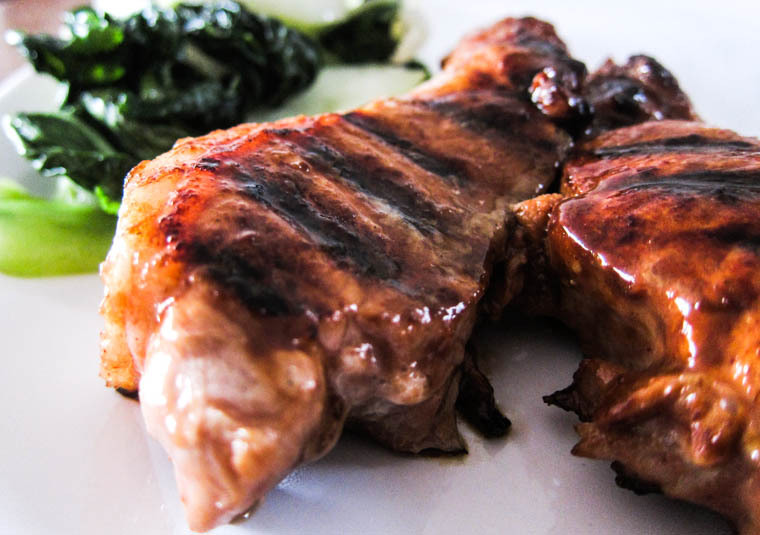 3-ingredient pan-grilled hoisin pork steak. Sometimes the rescuer in me wakes up, and seeks out neglected ingredients that have been sitting in a lonely corner for far too long. It makes me happy when I save them from oblivion and find them a good home. On a plate. In my belly. My recent efforts revolved around a full bottle of hoisin sauce in Simon's fridge. No one really knows who bought it, or how long it has been there. Every time I open the fridge, it niggles at me a little. I started to think about how awful the bottle of hoisin sauce must feel, because surely if you are a bottle of hoisin sauce, all you want to do is mingle with other delicious things, to create even more delicious things. Because I'm that kind of crazy woman. It just so happened that I won a competition and received the prize of an incredible meat tray around that time (thanks, The Vegetable Connection and Cherry Tree Organics!) so there were plenty of carnivorous delights to go around. One of the items in the meat tray were some lovely boneless butterflied pork steaks. I thought they would match well with the sweet, rich hoisin sauce, which is often described as a Chinese BBQ sauce. And thus, these 3-ingredient pan-grilled hoisin pork steaks came into our world. Combine hoisin sauce and oil. Rub all over the pork steaks and let them marinate for 1 hour, or longer. Remove the steaks from the pan and rest for another 3 minutes before serving. If you'd like to brush a little more hoisin sauce on your pork, or add other condiments like pepper... go for it! *Since this recipe has so few ingredients, it is important that you use a hoisin sauce that tastes good to you. The one I rescued from Simon's fridge is Ayam brand, and it also happened to be gluten-free. However, not all hoisin sauces are gluten-free, so if you are that way inclined, do check the label and list of ingredients. I also try to look for sauces that have a fairly natural ingredient list. 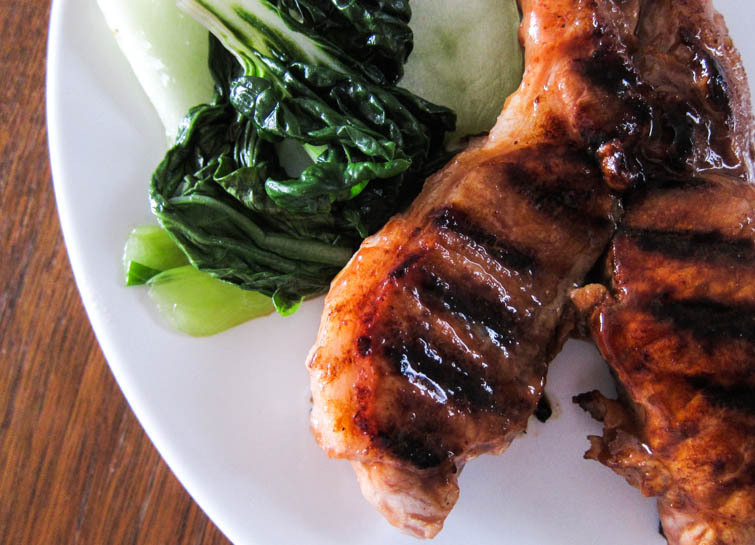 easy-as-anything pan-grilled hoisin pork butterfly steak with a simple side of bok choy. Poor sad and nearly-abandoned hoisin sauce. Why would anyone purchase you only to forget you and leave you lonely? You are the heroine of this epic tale. Good work! Now I just need to find someone to give me a meat tray. I'm not very familiar with hoisin sauce, but I seem to recall that I tasted it once, with duck breast, and I liked it ;-) must look for the sauce here and try with pork! Will definitely try this soon! Oh I love simple and minimal ingredient recipes - mostly because I'm too lazy to go shopping and that's all I have lol! Those hoisin pork chops look so juicy mmm!! I love using up items like that in the fridge. It makes me feel very resourceful. Love the bok choy there, too! Omg how juicy do those look! Love the char on the pork! Such a great idea! I would hate to be a neglected Hoisin bottle too! Don't worry, you're not crazy ;) These look sooo delicious! damn, those look AMAZING. like seriously, I've just had dinner and cannot stomach anything but I am really thinking of getting some steaks tomorrow. I don't use hoisin sauce that much to be honest, just never found the right use for them, but this looks RIGHT. So succulent and delicious looking! I always enjoy your recipes.